Recall that Doom is a multi-level first person shooter that ships with an advanced 3D rendering engine and multiple levels, each comprised of maps, sprites and sound effects. 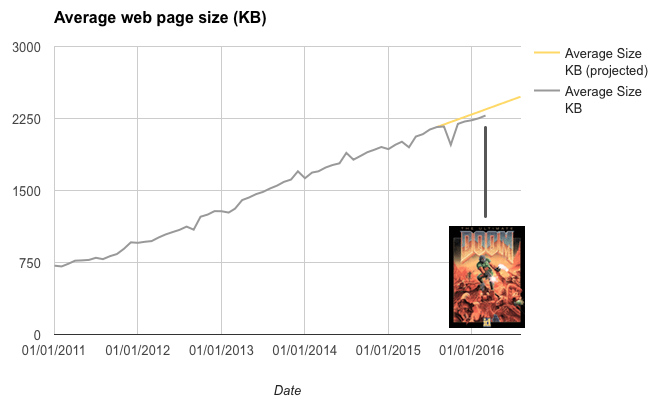 By comparison, 2016’s web struggles to deliver a page of web content in the same size. If that doesn’t give you pause you’re missing something. There’s some interesting follow-up remarks & hopeful conclusions in the original article, but still, over 2 Megabyte for a web page? Seriously? Think about what that does that do to your bounce-rate, esp. knowing that Google Analytics systematically underestimates bounce rate on slow pages because people leave before even being seen by your favorite webstats solution? Because on the web faster is always better and being slower will always cost you in the end, even if you might not (want to) know. This entry was posted in Internet, lang:en, performance, rants & raves, Web development and tagged average page size, httparchive, mobiforge on 25 April 2016 by frank.